“Oh wow, you lived in Japan? What was that like?” is most people’s reaction when I tell them I lived in Okinawa for three years teaching English. Well, it was an amazing experience for a start. I don’t think I can fully describe three years of living on a tropical island working as a peripatetic TEFL (Teaching English as a Foreign Language) instructor and early childhood education specialist in a short blog. But I’ll give it a go. I went out to Okinawa in 2000, taking what felt like the longest route possible. Scotland, London, Amsterdam, Taiwan and finally Okinawa. I arrived in December, which for locals was a cooler time of year, on average about 16 degrees centigrade. Coming from Scotland, 16 degrees in December seemed great! In my final year in Okinawa, 16 degrees felt positively freezing! On arrival I had no job and I wasn’t quite sure what I would do. My other half was already living there and working for the government on the JET programme. At this point in my life I was yet to achieve my BA in Early Childhood Studies or my post graduate EYP (Early Years Practitioner) status and so was not eligible for the JET programme. I found a job as a nanny on Kadena Airbase looking after two lovely boys whose parents were both pilots. I also taught English to young students at Kumon at the weekends. Kumon has now come to the UK. However following the events of September 11th 2001 security on the airbase made life rather difficult. The airbase became a different place to be and the working patterns of the parents became very unpredictable and so we agreed that they would be better finding someone who lived on the airbase. Now I was back to square one and unemployed. I tried to explain my situation to the Kumon teacher where I worked at the weekends. My limited Japanese and her limited English made this a rather difficult and often funny conversation. However, I managed to understand that my teacher wanted me to go to a local nursery school the following week at 10am, but I had no idea why! The following week I went to the nursery which was very close to where we lived. The owner didn’t speak a word of English but was very hospitable plying me with tea and shredded pigs ears (I’m a pescatarian, eating no meat, only fish). She was very jovial and thought it was great fun that I hadn’t a clue what was going on. After about 10 minutes the door to the nursery opened and in walked a Canadian guy who said “Hey, I hear you’re looking for a job!” And that is how I came to work for IAC, International Adventure Club which is an Academy of Language and Overseas Study. When I worked for IAC, we were quite a small team with a few Brits and a few Canadians travelling around Okinawa teaching English to preschool, primary, secondary and adult students. I travelled by scooter which is still my preferred mode of transport now I am based in London. I use my scooter 90% of the time here in London which is great for avoiding the over-crowding on the tube, and the unbearable heat on the tube in the summer. IAC has now expanded and has several schools throughout Japan. All the teachers worked from our base in Tomigusuku Shi. We only had two classrooms at the school so we mostly went out to teach on location. I was fuelled by coffee from vending machines, iced in the summer and hot in winter. Yes, hot cans of coffee from vending machines! 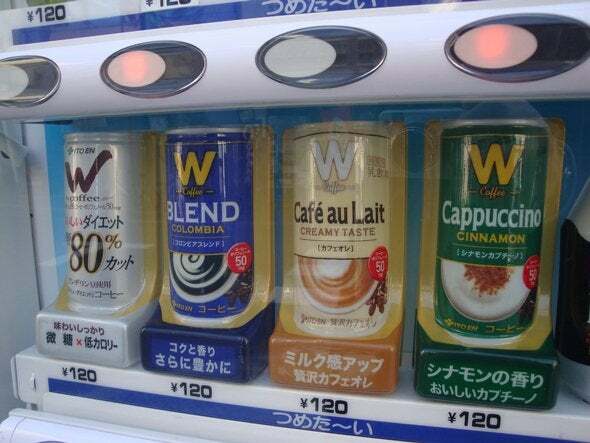 Hot Coffee from a Vending Machine! Okinawa had two seasons really, mega hot and about one month that was freezing (the afore mentioned 16 degrees which when acclimatised to a regular 30 degrees does seem very cold indeed). Teaching English to sometimes a whole nursery had to be well planned and very fast paced to keep everyone interested. So, imagine a 30 degree heat with 100% humidity. If you’re Scottish this means you are a sweaty mess straight after having a shower. Then you have to stand up in front of lots of children, dance, sing and run around for half an hour without stopping. I often had sweat dripping off the end of my nose! Then I would pack up my bag and drive onto the next nursery. I met some great people during my time in Okinawa, both fellow gaijin (outside person) and locals. I have some fantastic memories. The island itself is quite small and has the most amazing beaches. The snorkelling and diving opportunities were unbelievable. I learned to love raw fish and karaoke. I learnt to like the weather, but I didn’t love it. On a cloudy day I would look out the window and think oh great it won’t be as humid today, it looks cooler, but then I’d slide open the window and be hit by heat and think ‘oh no, it’s the same as usual’. I experienced typhoons and earthquakes, tsunami warnings and blistering heat. The Okinawan people are very kind and generous. They are also very patient when you try and speak Japanese! Teaching English was often a challenge for me in the humidity but it was never a chore. I had a blast and am truly grateful for the experience. Would I go back? In a heartbeat. I sincerely hope that I will have the privilege of visiting the beautiful islands of Japan and meeting some of my old pupils and colleagues again. If you have the opportunity to join the JET programme, go for it. You could even work for IAC, you can apply here. Tell Chris Sensei I sent you!